Little Wai Boy: More types of medicine..
are being prescribed for Wai boy. For the past two times when he was down with flu and cough, he was not given any medicine except for the drip to ease his blocked nose. 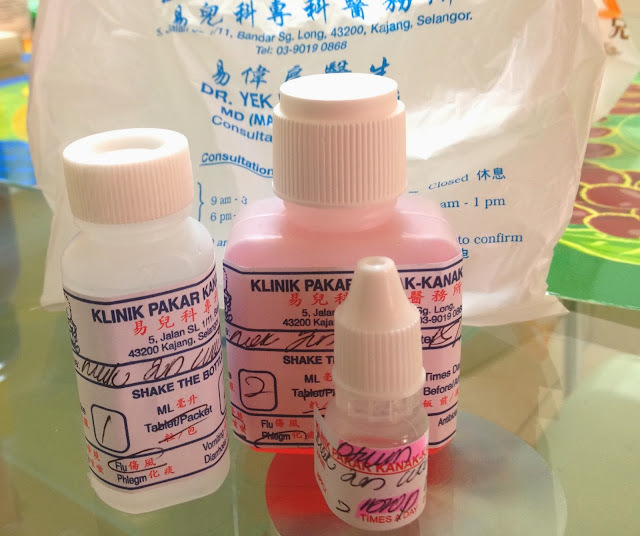 But today, Dr. Yek finally prescribed a bottle each of the flu and cough medicines besides the normal drip after knowing that our little boy is going into his 6th month very soon. Mommy posted this up here is not because of Wai boy is down with flu and cough again but instead Mommy felt relief knowing that from today onwards, little Wai boy will recover much faster from all these common illnesses with the medicines prescribed as compared to previous times when without the medicines, he had to suffer for at least a week before recovering. But what Mommy really hope is that we can pay lesser visit to the clinic except for the scheduled vaccination.